Everyone in the community was invited to come view the artwork of current McIntosh students in the annual art show. 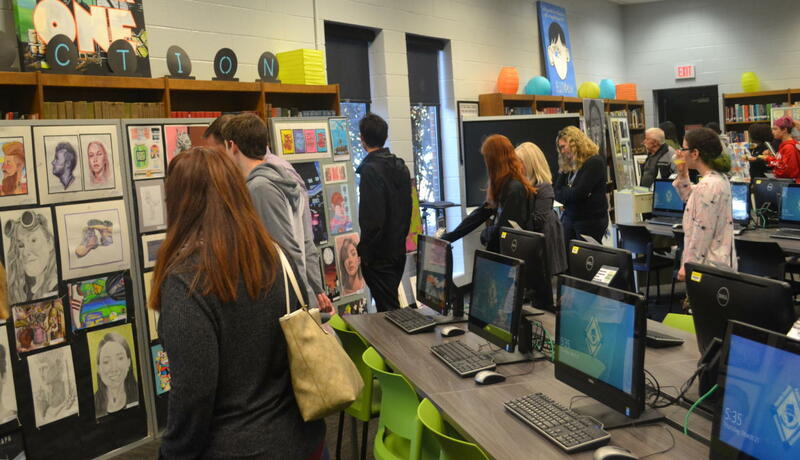 The McIntosh art department hosted the sixth annual art show on Thursday, March 21. Every year, art students from each level of the class select pieces that they wish to display, and boards are set up in a massive semicircle within the library. Students, teachers, family, and friends are all invited to tour the various works created over the artists’ school year. Additionally, the senior students that are a part of the National Art Honor Society (NAHS) receive colorful graduation cords at the end of the show. 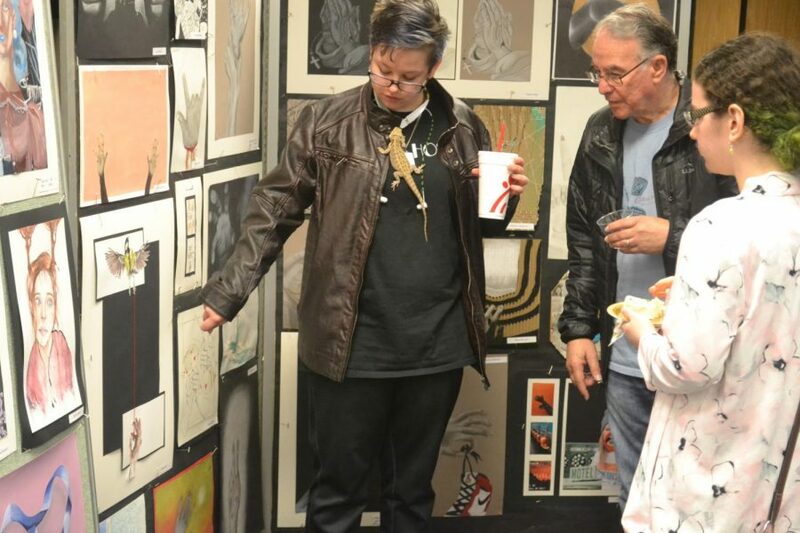 Sophomore Sky Gorland pointed out her own art to a curious visitor. Because her self portrait is based off of a picture of her with her bearded dragon, Roger, she chose to bring him with her to the show. He can be seen clinging to her shirt in this picture. The art show is days in the making, and art students volunteered to help set up the boards on which to display art, as well as the refreshments. Students are also the ones that choose which pieces are put on display. 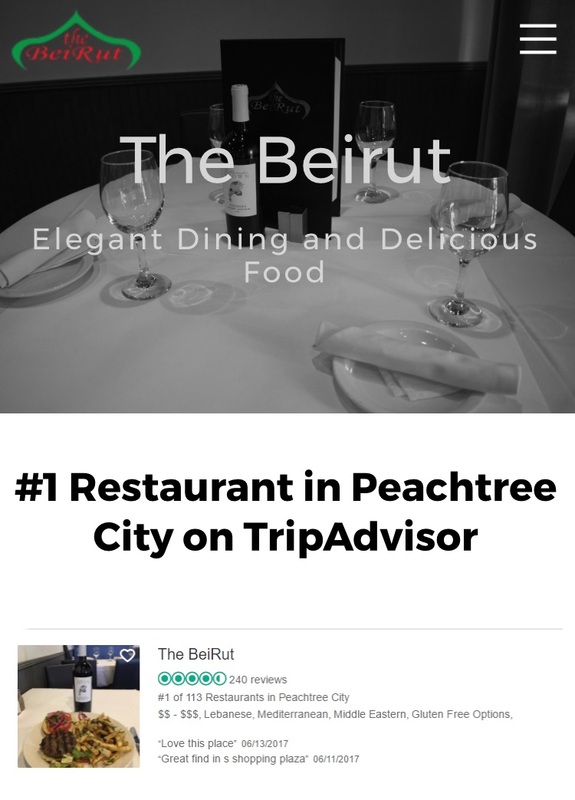 Each level of art is given an increasing number of pieces that they can submit; beginner art students choose one, second level students choose two, and AP Art students are allowed to select three. However, the art teacher, Carisa Green, also places an “extra” box at the front of the room, where students of any level are able to put their additional pieces that they wanted to display if there was room available. 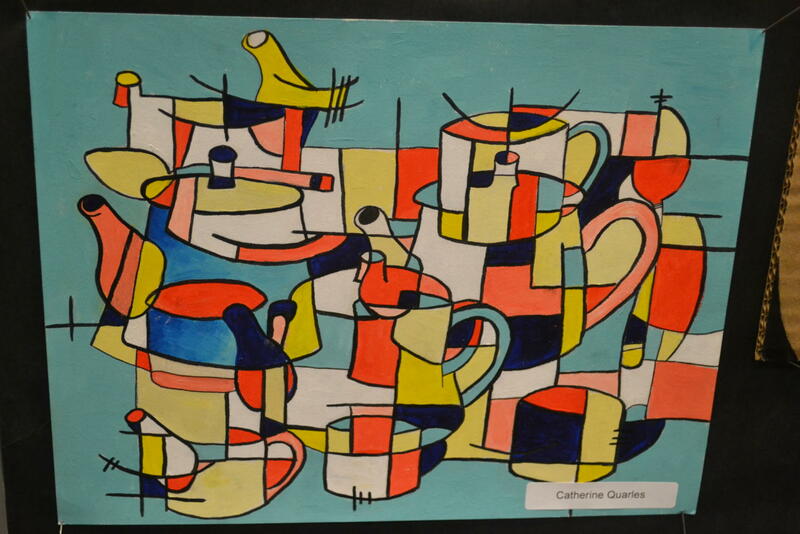 AP Design student, Catherine Quarles, created this piece inspired by a tea set that was given to her by her sister. Photo by Sylvie Call. Art students start off in beginner art, then move on to level two, called drawing and painting, and finish their art classes in AP Art. There are two available AP Art classes: AP Studio Drawing and AP Studio 2D Design. Green rotates which AP class is taught every year so that students can take both APs and be a part of the art program for all four years at McIntosh. Studio Drawing focuses more on improving the technique of an artist, while 2D Design focuses on enhancing student creativity and visual thinking. Keith Haber is the administrator in charge of fine arts, and he also attended the show. He said that he couldn’t pick a single favorite, and that he was proud of the art program for being able to put on this show every year to display impressive student art for members of the community. “This piece is totally different than any other piece I’ve made before,” said Shelkopf. “I challenged myself to make this piece unique by drawing it from two different perspectives, which was difficult, but super rewarding once I was finished.” Photo by Nick Shelkopf. Junior Nick Shelkopf had a couple pieces of artwork in the show. This piece took him about three and a half weeks to complete. 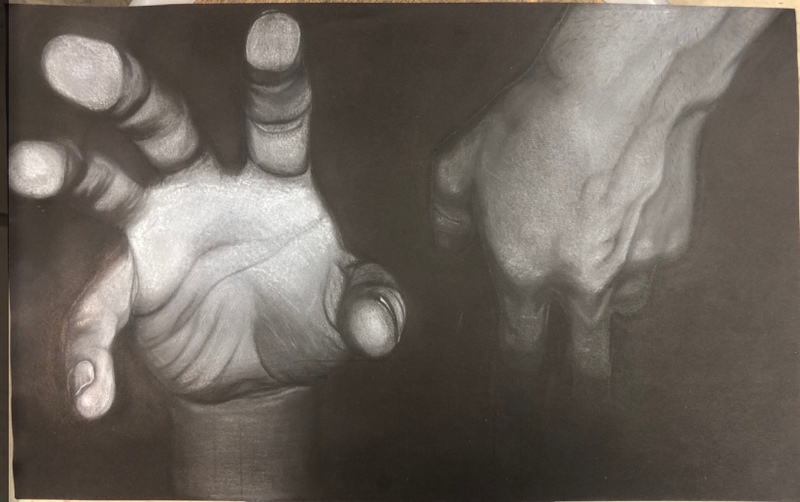 He used black and white charcoal to draw two hands reaching out for help. “Mrs. 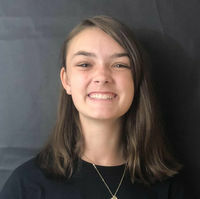 Green’s class is something I look forward to everyday because I know I can go into her room and let my creativity flow and create something that’s different than anybody else in the class,” said Shelkopf. 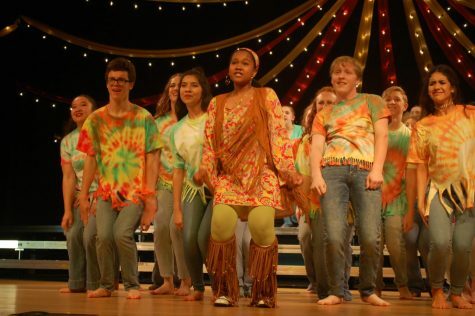 The art show is a way for students to present their artwork to the members of the community and their peers, but Green feels that the purpose of art is not necessarily centered in showing off. Junior Madison Snow is in AP Design. She used acrylic paint to create this piece as a part of her concentration. 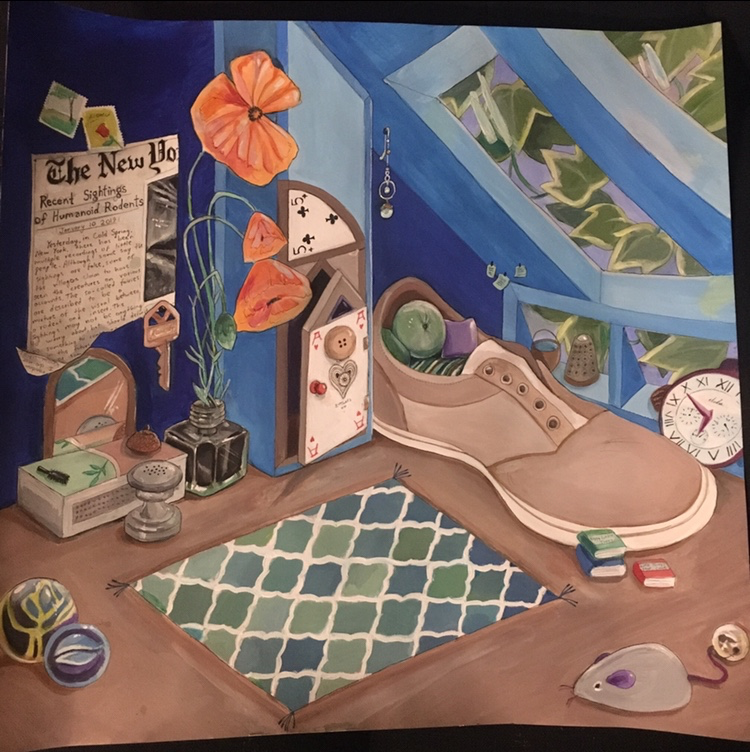 One of the requirements for AP Design is for artists to create a portfolio with a concentration each semester; a concentration is a series of artwork that conveys a story, typically 12 pieces in length. “I love creating art because I get to share my stories and ideas with others,” said Snow. Although many students take art at some point in their time in high school, few follow this pathway and make a career out of it. This fact, however, does not seem to take away the value of the class. “I’ll always appreciate pencil for its simplicity,” said Hart, “and it was the first thing I started with when I began drawing, so I have a lot of practice with it. I don’t get to be as creative though, since it takes away the aspect of color.” Photo by Jessica Hart. 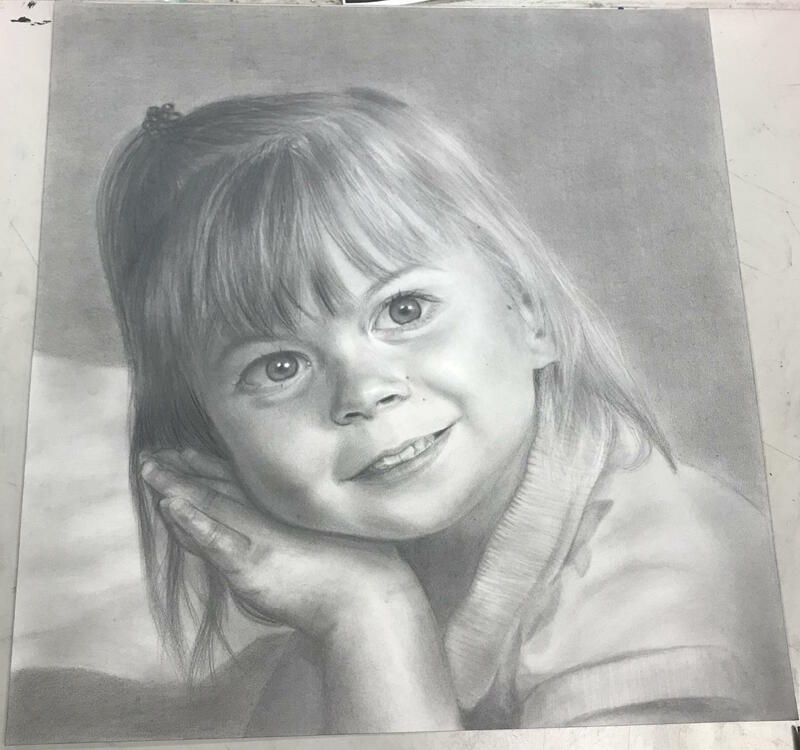 Sophomore Jessica Hart recently won the first round of the Kiwanis art competition with her childhood portrait. She drew this piece with pencil, and it took her about a month of class time to complete. Art is generally thought of as a natural talent, one that many people feel they do not have. However, Green encourages anyone to take an art class. At the end of the show, seniors were given honor cords for their participation in NAHS. 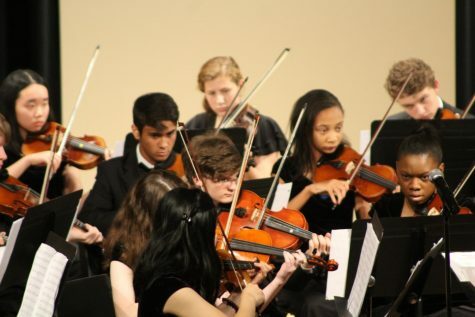 The honor society requires that participants give at least 25 hours of art-related service throughout their four years in high school. They complete projects like setting up art shows and painting pumpkins for teachers in October. Art club president and vice president — seniors Sabrina Haider and Vivian Scott respectively — presented the cords to the qualified seniors.